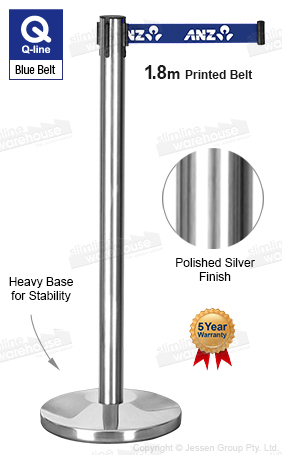 These retractable belt stanchions have a weighted base for a stable display, and features a rubberised bottom that helps protect the floor from scratches! These custom print barrier posts have logos in 1 colour printed on both sides of the belt for a new way to advertise your company name and maximise space. The belt is 1.8m long and made from blue woven nylon, offering a stylish look that easily reaches out to attach to other posts or wall clips. These crowd control queue barricades, retractable belt stanchions are made from stainless steel to offer a durable display that will last for years to come. The silver finish fits in great with any décor and offers a professional look. 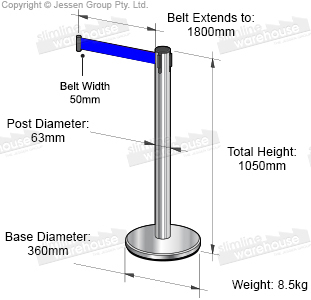 The end of the belt has a tamper-proof clip to secure the barrier post to a wall clip or other stanchion. Use the 4-way adapter to easily create a queue or section off an area at your location! Assembly requires no tools and only a few minutes to complete. Our online catalogue can be accessed to see all of our available products, with new items added weekly to stay current with trends & technologies. Slimline Warehouse also provides same day despatch to Sydney, Melbourne, Canberra, Cairns, Gold Coast, Brisbane, Adelaide, Perth, & anywhere else in Australia with most in stock items when purchased by 1pm EST!